BBC SPORT | Athletics | Get Involved | Are you a born athlete? Low graphics|Help Do you have the perfect build for athletics? Dr Kevin Thompson, physiologist at the EIS, explains the physical characteristics that make up the ultimate athlete. 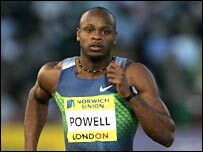 Sprinters are muscular and lean. Most distance runners are average height. 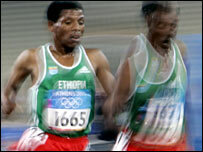 Being exceptionally tall doesn't seem to be an advantage - many world-class runners, like Haile Gebrselassie, are below average height. Throwers require a lot of strength and power, which can only be provided by large muscles. They are also heavy. They transfer some of their body's momentum to whatever they are throwing - and the heavier you are the more momentum you can gain. Throwers don't have to be lean as they don't cover any distance, which is why some shot-putters and hammer throwers can seem overweight. It is a big advantage to be tall. Long levers (arms and legs) help develop speed on the object, and give the thrower the ability to release it a long way from the ground.